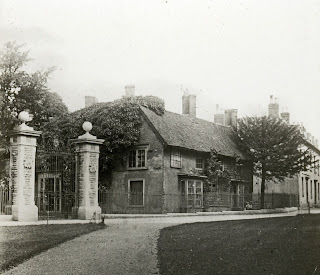 Frederick Burnaby has been described as a modern day (well Victorian) Hercules and was born in Bedford in 1842 at St. Peter’s Rectory (now part of Bedford School buildings). Colonel Burnaby’s achievements precede him, having survived frostbite, typhus, an exploding air balloon and arsenic poisoning. He successfully explored Uzbekistan, where it was so cold his beard froze solid and snapped off, was Colonel of the Queens household cavalry, became an MP, founded the society newspaper Vanity Fair, crossed the channel by air, wrote a string of bestselling books, commanded the Turkish army and died a heroic death in battle – welcome to the remarkable life of Bedford-born Fred Burnaby. Even as a child, Fred Burnaby was known for his fearless nature. Friends commented on how they would stand aghast at Burnaby’s daring in jumping the wide backwater at Newnham to save walking over the wooden bridge. As Frederick grew up (quite literally: he reached a whopping 6’ 4”) this confident and fearless nature would lead him to some astonishing achievements. Not content with the more common pastimes of the day, Frederick became interested in ballooning in the summer of 1864, he joined Monsieur Goddard a French balloonist in taking a flight from Chelsea gardens over London. Unfortunately, Goddard decided last minute that Burnaby would be too heavy for his balloon ‘The Eagle’. Undeterred Fred jumped into the balloon at the point of take-off as a stow-away. Amazingly, Burnaby’s 16 stone weight remained undetected by Goddard who was busy fuelling the fire. Burnaby’s ballooning career excelled when in 1882 he departed from Dover in a balloon borrowed from Mr Wright. Setting off for the Channel, he arrived later that day in Normandy, startling some local chickens and becoming the first hot-air balloonist to travel solo from England to France. Photograph of Colonel Frederick Burnaby by Thomas Fall. Fred Burnaby was also renowned for his amazing strength. He could break a horseshoe apart with his bare hands and his party trick was to bend a poker double round a dull dinner guest’s neck. The most comical demonstration of his strength was at Windsor Castle. Burnaby was a member of the Royal Horse Guards, an elite brigade called the Blues. 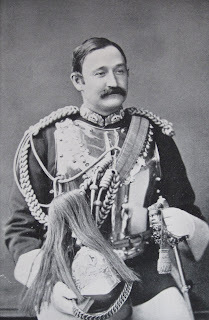 A horse dealer had come into possession of a couple of very small ponies, and brought them to show Queen Victoria. As a joke, Burnaby’s fellow Blues drove the ponies into Burnaby’s upstairs room. 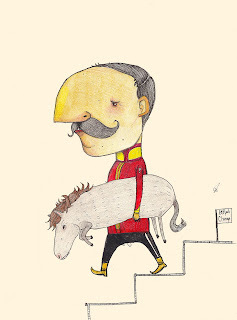 Fred was suitably amused, but then came the difficulty that the ponies would not descend the stairs. Burnaby solved the dilemma. Taking a pony under each arm he walked downstairs with them and set them in the courtyard to the great relief and amazement of their owner. 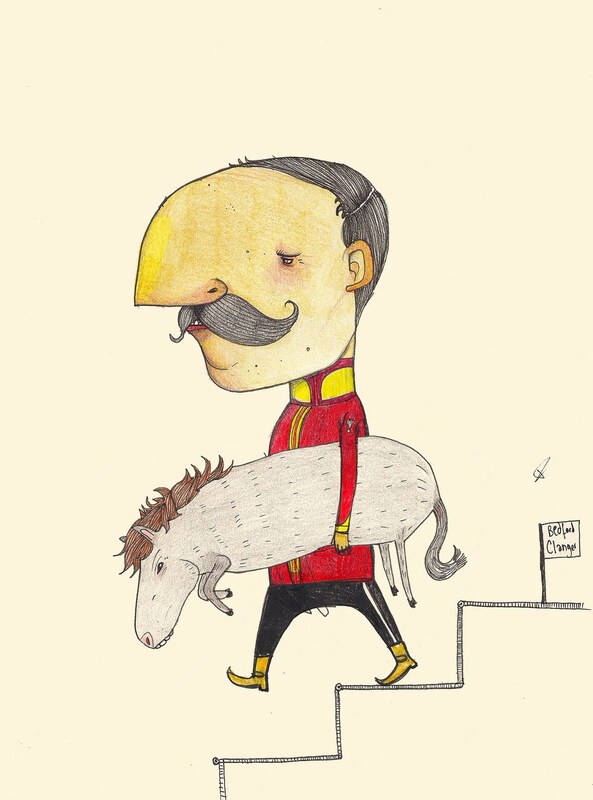 David Litchfield's Cartoon of Burnaby taking the ponies down the stairs at Windsor. To see more of David's fantastic artwork go to http://www.davidlitchfieldillustration.com. Frederick Burnaby died at Khartoum, Asia in battle in 1885. He was killed during an ambush by Sudanese warriors, aged only 42. 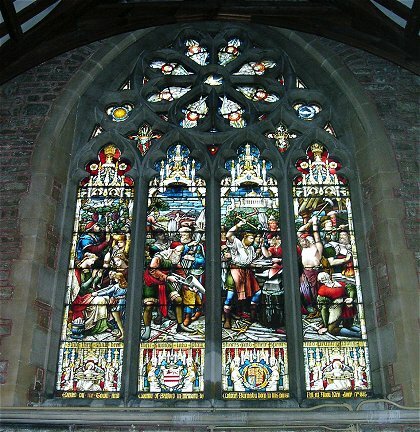 He was mourned by the nation, especially here in Bedford where a memorial window was placed in St. Peters Church in his honour. Burnaby was a favourite of Queen Victoria and she reportedly fainted when told of his death. Memorial window at St. Peter's Church: Depicts Isaiah (2:4) "And they shall beat their swords into plow shares and their spears into pruning hooks.... (In memory) ...of Colonel Burnaby born in this parish fell at Abu Klea Jan 17th 1885"
﻿﻿We would love to know, inspired of course by Burnaby's dinner party antics, what party tricks you have up your sleeves, so feel free to share them with us on the blog comments, email chag@bedford.gov.uk, post on Facebook , post your pictures to our Flickr group, or Tweet. This article has also been published in The Bedford Clanger newspaper this month - this can be viewed online at http://www.scribd.com/doc/64064341/sept2011-issue4 or is available from local information outlets, as well as local cafes.